In the central part of Lefkada is situated the area’s largest mountainous village of Karia, where is based the Musical-Literary Group “APOLLON”. In the beginning of the 1950s began to materialise the idea of founding such a group, which would contribute to the actual salvation, preservation and propagation of the land’s cultural heritage, as well as to the spiritual and cultural development of its members and the residents of Karia. The group’s first activity was the creation of a theatrical department. This is followed by performances in the square of Karia, which attract a multitude of people, both locals and visitors. The theatrical department traces a successful path up to 1966 when its last performance is given. Today, there are three levels (children’s, adolescent and adult) of the dance group functioning for learning and performing pan-hellenic as well as local traditional dances and customs, and they appear in dance festivals in most cities around Greece and abroad. The dance group has performed in folklore dance festivals such as the following. 1965: Amfilochia, Thessaloniki International Fair & Philadelphia (Athens), 1966: Levadia, Thessaloniki, 1970: Karditsa, 1976: Agrinio, 1977: Xanthi, Patra, 1996: Ilioupoli (Athens), 1981: Olympia, 1990: Siatista, 2000: Filiatra, Zakynthos, 2002: Florina, 2005: Lycabettus, 2006: Dora Stratou Theatre, Alexandria Imathia. Performances abroad include Zagreb 1977, France 1978, Italy 1980, Perugia Italy 1984, Trapani Italy 1986, France 1988, Castamona Turkey 1990, Hungary 1991, Frignano Italy 1994, Philippoupolis Bulgaria 1996, Brustito Romania 1999, Varna Bulgaria 2000, Nestia Bulgaria 2007. Since 1957 to the present day “APOLLON” participates unfailingly in the Arts and Speech Festival of Lefkada, in which its dance group carries out performances. At the end of August of every year the annual performance of the dance group takes place in the village square, where during a three- hour program dances from various regions of Greece, Eastern Romylia (Thrace) and Asia Minor are presented. “APOLLON” disposes of a large number of authentic traditional costumes from different parts of Greece such as Lefkada, Macedonia, Roumeli, the Aegean, Thrace and Epirus, while its wardrobe is constantly enriched. 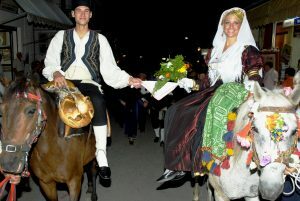 Since 1979 to the present day “APOLLON” carries out unfailingly on an annual basis the three-day event of the “RE-ENACTMENT OF THE PROVINCIAL MARRIAGE”, which is considered one of the most important cultural happenings in the Prefecture of Lefkada. In 1977 the event is filmed by Nestoras Matsas, while in 1980 the Provincial Marriage is presented at the Arts and Speech Festival of Lefkada, an event which was attended by the Greek Prime Minister at the time, Mr.Georgios Rallis. In 1954 the “Re-enactment of the Provincial Marriage” takes place for the first time in the square of Karia and all the marriage customs from the first to the last day are presented in great detail. The entire village participates in this leading event, which created the spark for the organization of the Arts and Speech Festival of Lefkada, seeing that Antonis Tzevelekis, who was the inspirator of the Festival, based it on the idea of the Provincial Marriage re-enactment. Nowadays, the event is presented during the first weekend of August of every year and it lasts three days, while the majority of the residents of the Municipality of Karia participate, a large number of volunteers, mainly young people who actively support “APOLLON” during all these years. On the first day there is a stage re-enactment in which all the customs preceding the marriage ceremony are presented in chronological order. This concerns a series of preparations related to the bride’s dowry, the new home, the bridal costume and all that is necessary for the ceremony and the feast. “ The match-making ”: The village matchmaker visits the bride’s house and announces to her father on behalf of the young man’s family, their interest in the young lady. Then, the parents of both parties come into contact and arrange the dowry. “ The marriage contract “: This is a written agreement between the two families, which includes every item the bride will receive as dowry. Usually, the village priest or teacher draws up this contract. “ The engagement “: The groom’s family goes to the bride’s home with gifts but mainly with the “ornaments”. This refers to the jewels with which they adorn the bride. “ The washing of the wool “: The wool comes from sheep’s hair. It is used to fill the mattresses and pillows, which the bride receives as part of her trousseau. 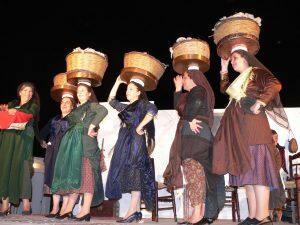 During the re-enactment of the marriage, a few of the women on stage load the wool into large baskets balanced on their heads and, while singing, take it to be washed in the village water source which is situated in the main square of Karia. There, after they have washed it, they load it onto horses and take it to the bride’s house, with the company of musicians. “ The leavenings “: These pertain to the ritual during which is prepared the yeast for the bride and groom’s “ Koulouria “ (cake rolls), which take the shape of large round breads and are offered at the feast which follows the marriage ceremony. “ The pinnings “: The pinnings are the ritual of survey of the bride’s trousseau. Women carry out the process, as a rule. The groom also participates and it is carried out as follows: the relatives and family friends gather the bride’s trousseau. The groom, marriage contract in hand, reads the items in it and calls to the women to present them by holding them up one by one. After this, the women embroider a red thread into the trousseau as good luck to the couple-to-be (hence the name “pinnings” given to the ritual). The marriage ceremony and wedding feast take place on the second day of the event. The couple, the priest and the best man (“ koumbaros “ in Greek), accompanied by musicians and a large crowd in authentic costumes, goes to a traditional stone-built house (which represents the bride’s home), where the re-enactment of the ceremony will take place, as it was done in the past. At the end of the ceremony, the trousseau is loaded onto horses and carried to the groom’s house, where the new couple will now live, while the wedding procession is again accompanied by singing musicians. A traditional feast in the village square with live traditional and folk music follows this. The event is completed on the third day with the custom of the “ wedding pie “. This concerns the preparation of the traditional oil pie of Lefkada, a dessert made only on the island of Lefkas for all the significant events of social and family life. The pie is prepared in front of all those present, to whom it is served afterwards. At the end of this event follows a feast with a traditional musical band in which the entire crowd takes part. The “ Riganada “ is an event that takes place every summer in the main square of Karia from 1984 to this day, and is based on a traditional meal from the mountainous parts of Lefkada. 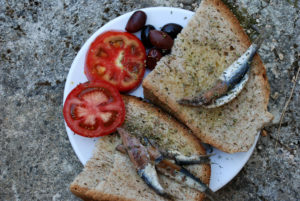 The “riganada” dish is made of dry country bread soaked in water, strained and topped with lots of oregano (“rigani“ in Greek, hence the name of the dish: riganada), olive oil, large-grained salt and vinegar. It is usually served along with olives, marinated sardines, ripe tomatoes and raw garlic. 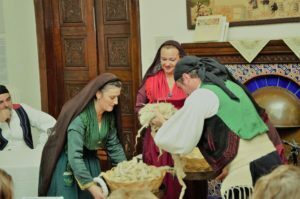 During the feast, “riganada” is prepared on the spot and offered to visitors along with local wine, while a traditional feast with live music follows. In over fifty years of existence and unfailing contribution to the cultural happenings of the region, “ APOLLON “ has developed activities in various cultural and artistic areas, serving with exemplary consistency the multi-dimensional presence of Greek Traditional Dances. “ APOLLON “ has succeeded in presenting a considerable body of work, thus earning the villagers’ trust and securing young people’s cooperation. Its organization, its dancers’ excellence and its material foundation in traditional costumes rank it as one of the most dynamic cultural associations in Greece. The events it pioneers are ornamented with integrated performances of traditional music and dance from all parts of Hellenism, with special emphasis on local happenings. “APOLLON “ is a also a member of the International Organisation of Popular Art (I.O.P.A. ).